Proofreading and editing your document is excluding VAT. Our services are exempt from VAT. Calculate the costs for having your document edited. The Scribbr Plagiarism Checker includes VAT. Check the costs of the Plagiarism Checker. Is it possible to pay after completing the order or in instalments? No, it’s not possible to pay in instalments after the order is completed. Before an editor can start working on your thesis the order must be paid. As soon as you complete your payment, we will receive a notification and send you a payment confirmation. The deadline starts as soon as we’ve received your payment. The maximum file size for the proofreading and editing service is 40MB. Unfortunately, the editor cannot check larger documents. This is because we can no longer safely send the document via our server to the editor. In addition, because of its size, the editor will have difficulty with opening and editing the document. We can accommodate up to 400 pages per upload. If your file is too large, then you can split your document and upload it in multiple parts. You will have to pay for each separate file you upload. If your document is larger than 40MB, this is probably due to large images in your document. There are several ways to make the file size smaller. Word can compress your images without visible loss of quality. Please see the manual of Microsoft Office about how to compress your images. In most cases, the document will be small enough. When the images in your document are still too large after compressing them, it is best to delete the largest images until you are below the limit. When you feel that this could impede the editor, you can upload a PDF version of your Word document in step 4 of the upload process. We will make sure that the PDF version is sent to the editor so that the editor can always access the PDF version when necessary. Can I download an invoice? Yes, you can download your invoice after you have paid for your order. Add an optional reference to your invoice. This is useful when you want to send the invoice to your school or internship company. Press “save” to download your invoice. How do I make changes to the invoice? If you want to make a change to the invoice (for example, the reference), then send an email to finance@scribbr.com. In this email, clearly state what you would like to have changed. Please note that editing the invoice can take up to 5 business days. How are the rates per word calculated? You can easily calculate the costs of editing your thesis using our price calculator. Next to the rate per word, there is a setup fee of $20. How do you convert an .odt document to a .docx document? When editing your document our editors use ‘Track Changes’ in Word. This is an extremely useful tool with which you can easily see what the editor has done. You can, however, easily convert an .odt document to a .docx document. Below we explain how! 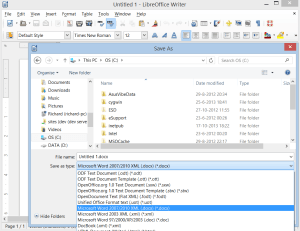 Open the .odt document with your word processor (for instance Open Office software like LibreOffice, or simply with Microsoft Word). Save your document with the ‘Save As’ option and save the text as a .docx document. You can select this option when you are indicating what type of text you are saving (below file name). How can I upload my thesis? We explain how to upload your thesis, how to select the pages that need to be edited and how to pay on the following page: how does it work? What file formats are supported by the thesis Proofreading & Editing service? The editor will improve your thesis using ‘Track Changes’ in Microsoft Word. We will always return to you a .docx file. In this Word file you can accept or ignore the changes the editor has made using the ‘Track Changes’ tool in Word. You can convert .odt files to .docx in OpenOffice or LibreOffice. Would you like to have your document checked for plagiarism? Then upload your thesis in .doc, .docx or .pdf format. For more information go to Which file formats are supported by the Scribbr Plagiarism Check? Can Scribbr proofread and edit my thesis in LaTeX? Yes, we can proofread and edit your LaTeX document. However, because our editors work with the track changes functionality in Word, we will have to convert your LaTeX document to a .docx document (Microsoft Word). Converting a LaTeX document into a .docx document is not difficult, but it may mix up the layout of your document partly. This means that you need to check the layout afterwards. Next to that, you have to implement all the changes made by the editor in your original LaTeX file. You can convert your LaTeX file to a .docx file in 3 steps. Save the LaTeX file as a pdf file. Save the Microsoft Word file. Please contact us if you have any difficulties converting your file yourself. We can convert your document for you. While uploading your document, you can also add your pdf file as an additional file. This may help your editor while editing, because it will show your editor the original formatting of your text. Scribbr told me that my document has to be split between multiple editors. What does that mean? When you upload your document and select a deadline, Scribbr will determine whether one editor can edit the whole document in the selected time period. If that is not the case, we will ask you to extend the deadline. If that’s not possible for you, Scribbr has to split the document between multiple editors. You will receive an email notification informing you of which editor will edit which part. The editors will be in contact with each other to ensure consistency. This also means that you will receive an email and text message from us whenever one of the editors is finished proofreading. You can login to your account anytime to check the status of your orders. Note: You will usually receive your edited documents in parts, which you can simply merge into one. Should you encounter any problems, you can always contact our support team. If your deadline allows it, Scribbr can also merge the different parts for you. Our support team will inform you accordingly when splitting the document. Can I send you my supervisor’s feedback? Yes, you can send your supervisor’s feedback to us in an additional document while uploading your thesis or paper. We’ll make sure to pass this feedback on to the editor who will proofread your text. Note: It is often more useful to summarize the feedback and ask direct questions to the editor instead of handing over lengthy documents with many requirements. The more information there is the less detailed the editor can answer the questions that are most relevant to you. Your editor is already familiar with the requirements for academic writing. Too much information can make it unclear to the editor what to focus on specifically to help you in the best way possible. Can I upload my thesis in sections? Yes, you can upload your thesis in sections. We try our best to ensure that the same editor checks all the different sections of your thesis. When you upload a new file, our system recognizes you as a returning customer, and we immediately contact the editor who helped you before. You can be flexible about the deadline. Please note that the shorter your deadline is, the bigger the risk that your previous editor is not available. If your previous editor isn’t available, then we will inform you immediately and look for another qualified editor. Fear not! Every Scribbr editor follows the Scribbr Improvement Model and will deliver high-quality work. However, every editor has a slightly different editing style, so you may notice small inconsistencies in editing choices. As with every proofreading order, be sure to carefully review your editor’s changes and suggestions as you finalize your text to ensure that everything is as you want it. Is it possible to edit (for example) only one or two chapters of my thesis? Yes, you can select the pages you want to have edited yourself. This way you can, for example, select only your introduction and your conclusion to be edited. When you are uploading your thesis you can select which pages you want to have checked in Step 3. Check out how you can upload your thesis.